In developing countries, it is estimated that over 40% of the population are children under the age of fifteen. Thus, children and adolescents are the largest key population for TB control and prevention. approach. Diagnosing tuberculosis (TB) in children is more difficult than in adults and treatment needs to take into account the specific needs of children and their families. Children with TB differ from adults in their response to the disease: (a) They are at increased risk to develop serious forms of TB, especially TB meningitis and military TB (2), and associated high mortality. (b) Their disease progression is usually much more rapid and dramatic, while presenting less typical symptoms. (c) They also have an increased risk of progressing from primary infection to active TB, and are therefore an important target group for latent TB infection treatment (LTBI). (d) Lastly, they are usually entering the health care system through different channels and mechanisms –as mother and child care, vaccination, pediatric consultations, grow control- which are often less TB aware. 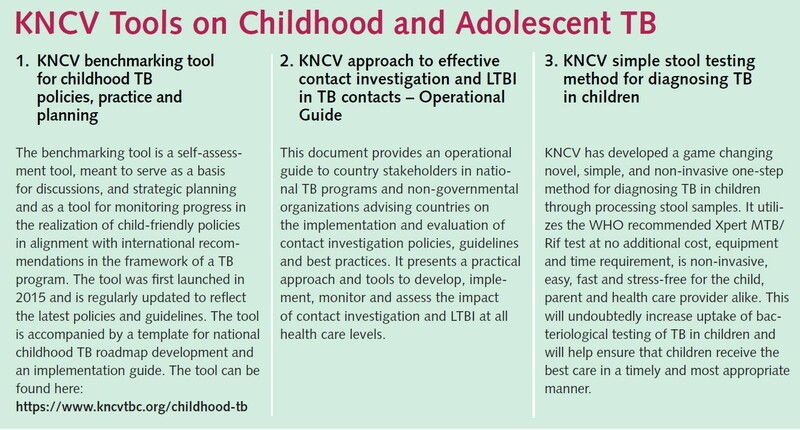 KNCV Tuberculosis Foundation (KNCV) is at the frontline of the fight against TB in children and adolescents with the development of policies, guidelines, tools and approaches. World Health Organization (2018), Roadmap towards ending TB in children and adolescents. Geneva: World Health Organization; 2018. Licence: CC BY-NC-SA 3.0 IGO. Development of international and national policies, guidelines and SOPs for preventing and addressing TB in children and adolescents, including WHO guidelines, latest updated recommendations and the childhood and adolescent TB roadmap. Contributing to global evidence on childhood TB prevention, diagnosis & treatment through data analysis and publications to reduce the research gap. Inclusion of children into KNCV’s Patient Triage Approach for diagnosis of TB and DR-TB and selection of most effective and shortest possible treatment regimens, containing new drugs, safety monitoring etc. Development of child-friendly and non-invasive methods and algorithms for TB screening and diagnosis of TB in children. Providing and coordinating advanced technical assistance for childhood TB through extensive associated pool of experienced international childhood TB experts who provide: trainings, distance consultations, revision of policies, guidelines and development of Standard Operating Procedures for clinicians. Advocacy to policy makers, donors, governments, national & international partners for: a) The use of child-friendly first and second line drug formulations, b) Best practices, c) Access to diagnostics and new drugs, and d) Investment in and commitment to childhood TB interventions. Promoting and supporting enhanced contact investigation and LTBI through different strategies and approaches. Ensuring that childhood TB is included in all TB trainings, targeting relevant health care professionals and pediatricians. Promoting and implementing activities directly and indirectly related to reduction of stigma and discrimination through dedicated stigma reduction interventions (www.kncvtbc.org/en/stigma), patient stories, awareness campaigns, etc.